Cornwall is located in the far south west of England on a peninsula that stretches into the vast Atlantic Ocean, with a dramatic coastline of almost 300 miles it is almost completely surrounded by the sea. The county is split into three sections North Cornwall, South East Cornwall and West Cornwall. Cornwall has many leafy estuaries, captivating fishing harbours and villages, spectacular beaches, and an abundance of exotic gardens and beautiful meadows that flourish in Cornwall’s mild climate. Cornwall is also home to the captivating wilderness of the Bodmin Moor with fascinating prehistoric remains, fantastic walking trails from gentle strolls to challenging hikes, many castles, intriguing towns and villages and holds many local legends. At the beginning of the 19th century Cornish mines were some of the largest anywhere in Europe and the copper industry, centred in West Cornwall, grew beyond any other sector in the British economy. In the old industrial heartland, the landscape has been awarded World Heritage Site Status and is dotted with remnants of its mining past illustrating Cornwall’s enormous contribution to the Industrial Revolution with engine houses, museums and miles of recreational trails. Cornwall’s maritime legacy is never far away where local fishermen land their daily catch of fresh seafood and where tall ships, luggers and ketches unfold their sails in the Cornish breeze. Cornwall has long been one of the most popular UK holiday destinations and is a truly wonderful and beautiful county. Its natural environment is recognised nationally as the Cornwall Area of Outstanding Natural Beauty which can be enjoyed by everyone and can be accessed by the South West Coast Path. The flourishing tourist industry provides a host of accommodation options such as holiday cottages, camp sites, caravan parks, hotels, bed & breakfast and guest houses. North Cornwall is an Area of Outstanding Natural Beauty and of important geological and scientific interest. The coast of North Cornwall is the only part of the county that is formed of carboniferous sandstone, a type of rock that is around 300 million years old, the rest lies on Devonian Sedimentary Strata and the granite of Bodmin Moor. Famous for its remote, bleak coast line North Cornwall from Bude to a place called Rock close to the Camel Estuary has been protected from development by its sheer inaccessibility. From Padstow to Portreath the North Cornish Coast, exposed to westerly storms and pounding surf, is a landscape carved and sculptured by the sea and the coves and caves portray many tales of smuggling and wrecking. The sea with its gigantic Atlantic rollers has made the Cornish north coast famous for perfect surfing conditions. Other extreme sports such as coasteering, zapcat, scuba diving and rock climbing are also very popular. The North Cornwall’s dramatic Atlantic Heritage Coast has 60 miles of cliffs, coves, sandy bays, market towns, country houses, historic castles, farmsteads and the wilderness of Bodmin Moor. Some of the most visited places to visit in North Cornwall are Bude, Newquay, Wadebridge, Bodmin, Bodmin Moor, Tintagel, Boscastle, Camelford, Padstow, Launcester and Port Isaac all with their own unique history and a variety of things to see and do. Padstow a working fishing port was made famous by celebrity chef Rick Stean, Port Isaac is the where the television series “Doc Martin” is filmed and Tintagel has long been associated with King Arthur and Tintagel Castle being his birth place. The Camel Trail is another popular activity for walkers and cyclists running for 18 miles it follows the River Camel from the Camel Estuary at Padstow to Wadebridge, Bodmin, Poley’s Bridge and finishing at Wenford Bridge. Tintagel is a village on the Northern coast with wonderful views of the Atlantic Ocean, Camelot Castle and Tintagel Castle. Tintagel located within the Cornwall Area of Outstanding Natural Beauty probably originates from Dindagell a Cornish word meaning “fort on the constriction” referring to the fort or castle on the headland. Farming has been the main working life through the ages and slate was also a valuable trade proving building stone and roofing for local buildings as well as being exported far and wide. Vessels would beech at Tintagel Cove loading and unloading their trade for sale and export to parts along the Bristol Channel. It is known that smuggling was present on the dangerous waters and many wrecks furnished local households with goods washed up in the aftermath. The village has now been cleaned up and modernised by a regeneration project during 2003 and 2004 costing over £4 million. The Old Post Office with a buckled roof in the centre of Tintagel was originally built as a small manor house in the 14th century and became the post office in the 19th century. It became a Letter Receiving Office for the area in the 1870’s after the village and surrounding parish started to handle 125 letters a week. The National Trust bought the building and its surrounding cottage garden in 1903 for £200 which was raised by public appeal. The National Trust have restored it to its present condition and is now open to the public, an entrance fee applies. Tintagel’s Anglican Church of St. Materiana is situated on the cliffs between Trevena and Tintagel Castle and is listed a Grade I building. The large graveyard is said to have been extended three times and the two most interesting memorials are the tomb of John Douglas Cook founder editor of the Sunday Review and the wooden cross over the grave of 14 year old Domenico Catanese who died at Lye Rock when the Barque Lota was driven against the cliff, the rest of the crew survived. The dominating Camelot Castle Hotel also overlooking Tintagel Castle and the Atlantic Ocean offers rooms with stunning panoramic views over the rugged coast line has a restaurant and bar and a tea room and cafe. Tintagel Castle, a wonderful place, is the most visited castle in Cornwall. It is set high on the island and is believed to be the birth place of King Arthur. 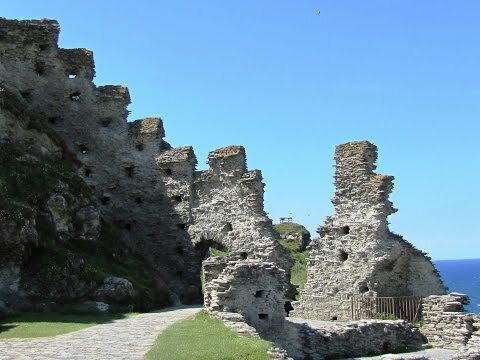 The castle was built in 1233 by Richard Earl of Cornwall and as you climb the path to Tintagel Island you can see Merlin’s Cave at the base on Castle Beach. Castle Beach also known as Tintagel Haven is a small sheltered tidal pebble beach and at low tide you can enter the cave and see through to the other side. Merlin who was King Arthur’s teacher is said to have lived in this cave. Grey seals are often found in this area. Treknow, Tre being a Cornish word meaning settlement or farmstead, is a small village a mile from Tintagel and also lies within the Cornwall Area of Outstanding Natural Beauty and was established in the early 16th century to house quarry workers. Slate was quarried here from about 1305 to shortly before the Second World War and in late 18th century a small copper mine was in operation. The remains of the old quarry workings are still visible on the coastline. The acidic local soil was manured with beach sand from nearby Trebarwith Strand and this trade led to road improvements in the early 19th century. Treknow houses a village hall and two small hotels. The former small Chapel of the Holy Family, built in 1929, has now been converted into a private residence. Trebarwith Strand was also once at the centre of the slate industry where stone was quarried and exported. This natural cove grew in importance due to extensive quarrying along the cliffs and at the Prince of Wales quarry further inland. It was easier to extract slate on the coast and then simply shipped out directly from the quarry site via Port William, a small harbour at the south end of the cove. Any waste materials were just thrown into the sea. Trebarwith Strand’s beautiful beach is now popular with locals and holiday makers. The clean sand, warm pools and climbing rocks are great for children and the strong winds off the Atlantic Ocean make great waves for excellent surfing. The beach is tidal and at low tide it extends for almost a mile. At high tide the water covers the beach completely for about two hours. During holiday seasons lifeguards are present to ensure the safety of bathers. We park at the far end of Tintagel near Camelot Castle and walk into the village for a look round and to visit the Tourist Information Centre we then head back to The Cornishman Inn and take the no-through road at the side signposted Parish Church and Glebe Cliff. We follow the little road to the church and head straight forwards through the churchyard and go through a gap in the bank on the left to the car park. We turn left and follow the track, passing the Coast Path sign on the right, until we reach some buildings at the end of the track. We turn immediately right and follow the track at a sign post towards the sea. We pass some houses and then head across the fields following the markers and turn left onto the Coast Path. We follow the Coast Path for a short way then turn left on a track signposted Treknow. At the end of the track we turn right past the Atlantic Hotel on the left and the footpath signposted to the Coast Path on our right. We head forwards on the track passing a guest house on our left then head downhill to Trebarwith Strand then up the other side passing the Port William Inn to view the caves. We then retrace our steps back down to the Strand then back up the other side on the path we came down on but half way up we turn left at the signpost to take the Coast Path. We now follow the Coast Path all the way to Tintagel Castle passing through Glebe Cliff National Trust Nature Reserve. We go into the castle and over the bridge to the island. We walk round the island then back over the bridge and turn left through the exit gate and then right at the top of the waterfall to go past the Beach Cafe and through the car park. We then follow the track uphill back to Tintagel. This is a moderate walk with inclines and declines on well walked public footpaths and tracks through fields with stiles and on the cliff edges along the coast. Approx 6 miles allow 2.5 hours (To visit Tintagel Castle allow extra time) using OS map 111, Bude, Boscastle & Tintagel. Start Point: Tintagel village centre. Tintagel is situated on the coast of North Cornwall between Bude and Newquay in the south west of England. From the M5 take junction 31 and merge onto the A30 towards Bodmin and Okehampton then take the A395 at a roundabout towards Hallworthy and Camelford. At t-junction turn left onto the A39 towards Wadebridge. Turn right onto the B3314, turn right onto the B3266, turn left onto the B3144 and turn right onto the B3263 to Tintagel. Parking: There are four pay and display car parks and also some free roadside parking. There are public toilets at the Tourist Information Centre in Tintagel and at Trebarwith Strand. For refreshments in Tintagel there are shops, cafes, bakeries, pubs and restaurants. At Trebarwith Strand there is a beach shop, cafe and one pub the Port William Inn.